Do you feel there’s too much color in the web? 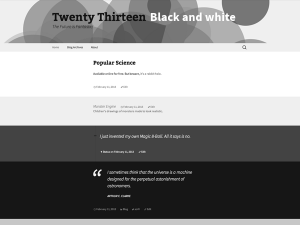 Try our brand new 2013 Black and white Free Wordpress theme! 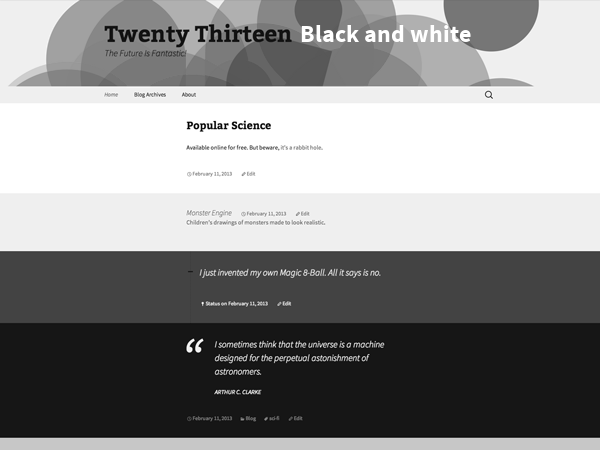 It’s a lightweight child theme of Twenty Thirteen (the default theme for WordPress 3.6), based on several shades of grey for different post formats. The CSS stylesheet aims to be simple to understand and edit to fit your needs. Like our other projects, it’s released with a GPL license. 2013 Black and white is an easy starting point for desaturated websites, try its 50 shades of grey, and more!